Lenders globally may need 70 bln euros more to meet rules on trading-related risk. That looks kind to most investment banks: Basel-based standard-setters are in conciliatory mode. But the changes could put a ceiling on how much broker-dealers can ramp up risk – and revenue. 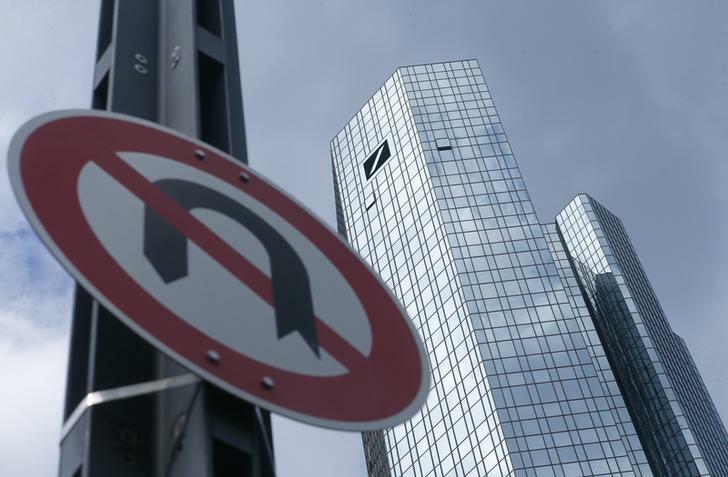 A 'No U-turn' traffic sign stands in front of Deutsche Bank headquarters in Frankfurt, Germany June 9, 2015. Capital requirements for the world’s biggest trading banks could rise by 70 billion euros from 2019 under new rules published on Jan. 14. The Basel Committee on Banking Supervision said the changes would increase the proportion of risk-weighted assets (RWAs) related to trading risk from around 6 percent to less than 10 percent of overall RWAs. Each percentage-point increase is equivalent to less than 20 billion euros of capital for the sector, according to a person with knowledge of the rules’ effects. However, some banks may simply let their key capital ratios decline rather than choosing to increase equity. The new rules come into effect at the start of January 2019. On Jan. 11, the oversight body of the Basel Committee said the latter would focus during 2016 on not significantly increasing overall capital requirements for the sector.